Chronos turns any watch - Timex or Rolex - into a smartwatch. No need to buy a fitness tracker or oversized Apple Watch, just attach the quarter-size Chronos to the back of the watch you already love. Track steps and activity, receive personalized filtered notifications, and control your phone and music all from your favorite timepiece. 1 $100,000 revenue in first week: 1,000+ units sold. 2 ~65% expected retail margins. $129 MSRP. 3 3mm thin; world's small wearable. 4 Select investors include: PCH International, CrunchFund, Highway 1. 7 years experience at the intersection of consumers and technology at Piper Jaffray. Dartmouth and Univ. of Texas alum. 6 yrs in product design and development. Prev. at Samsung's Product Innovation Team. Design engineer with Raytheon, Delphi, Navistar and ThemeWorks. I wear a 70 year old watch that I'd never replace. Yet, I'd always wanted to receive notifications or track my physical activity from my wrist. So when I heard about Chronos, I went straight to their office to get a demo. They did not disappoint! As advertised, the Chronos fit snugly on the case of my watch - 3mm is thin. But more then that, I was impressed by Mark - not only by his passion for watches, but his vision for embedding tiny wearables in all the stuff we already love. Investing in Chronos is betting that brands will partner with them to make their products "smart". That's a bet I'm taking. Given how polarizing smartwatches have been, Chronos may be a great way for people to try basic wearable tech without ditching their beloved timepiece. People who like watches tend to really like their watches. That means most aren't giving up their hard-won collections in favor of something digital… The Chronos device is one of the best attempts yet at addressing this gap. It’s a cleverly conceived and unusually well executed – and very affordable – way to get your feet wet in a wearable/mechanical watch detente that feels like a real synthesis, rather than feeling like a compromise. CEO of Outlier. Founder of Flurry (now part of Yahoo!). Active angel and startup advisor. 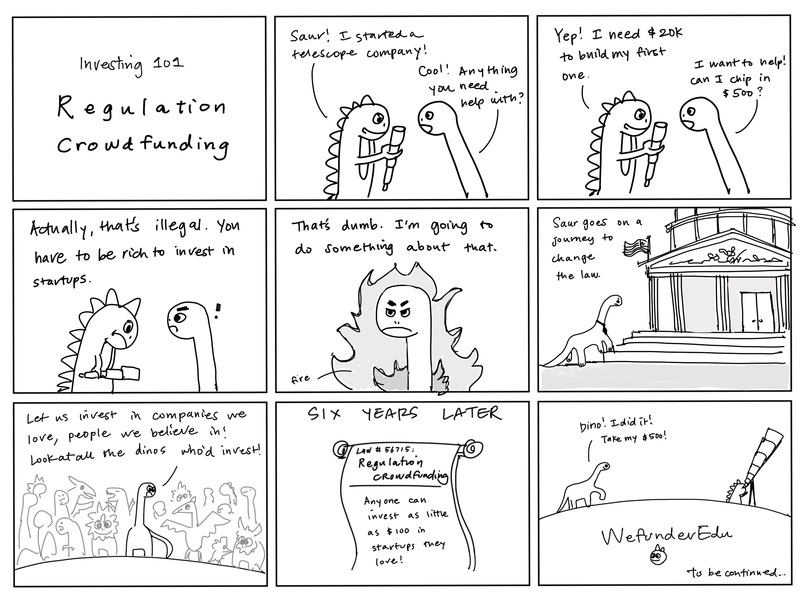 Seed, venture and growth-stage investor. Portfolio includes: Battlefy, Prompt.ly, RadPad and more than 12 early startup companies. We design custom product solutions for startups and Fortune 500 companies. At PDH, we make. CrunchFund is a venture capital firm founded by Michael Arrington and Patrick Gallagher. Highway1 is an accelerator of hardware startups. We help hardware companies design, manufacture, distribute and retail their products. Own 17 industrial businesses with $5 billion in revenue globally. I am interested in B2B, early stage tech companies. I'm an internet entrepreneur who is seeking out investment opportunities especially those that have the potential to make the world better. The world’s thinnest wearable, Chronos comes in at under 3mm thin, so it doesn't interfere with the design or feel of the watch while it tracks your fitness metrics. Micro-suction technology attaches and detaches to 80% of current watch designs. That means no sticky adhesives, no residues, and no magnets. Control phone with taps and gestures that silence calls, skip music tracks, and more. User customize Chronos so they're only notified by the things they care about. CEO Mark Nichol pitch at Demo Day. Also CTO Luke Fromowitz explains Chronos at CES in Las Vegas. Chronos only launched in Mid-November. They sold out their initial launch in 2.5 hours and another 750 pre-orders in the next few days. Download the entire slide deck as a PDF. Watch companies know they need to make their products smart, but lack the expertise to do so. 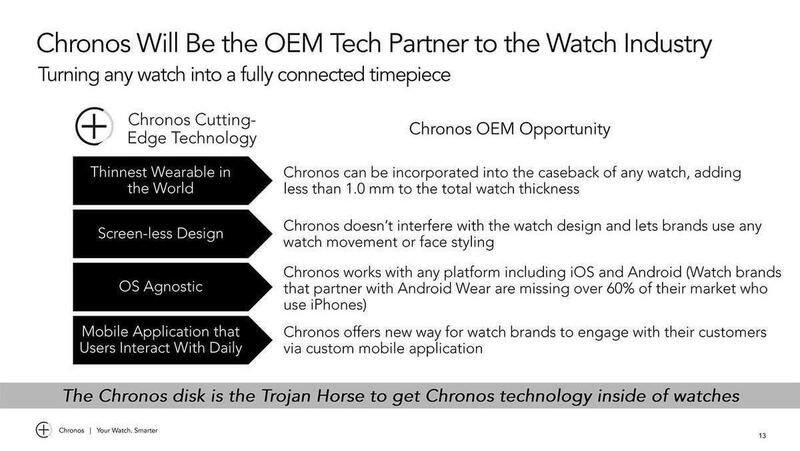 The largest US watch manufacturers are already exploring partnerships with Chronos in advance of their big launch this coming spring (details confidential). 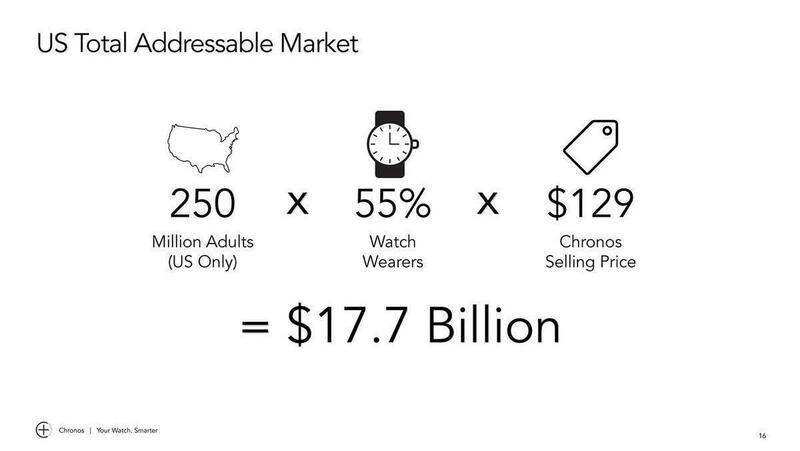 By leveraging the design expertise and distribution of major watch brands, Chronos has a chance to power more wearables than any other consumer brand in the market. Customer surveys reveal that most consumers just don’t like the look of current smartwatch / fitness wearables. Any wearable is effectively a piece of jewelry and if it doesn’t look good, only fitness fanatics will wear it regularly. Just like a watch, necklace, or any piece of clothing - wearables are an expression of the customer’s style. Chronos is solving that problem. We’re enabling anyone to track all the fitness metrics of our competitors, as well as being able to receive unique, personalized notifications, while preserving their own sense of style. Chronos makes you healthier, educates you about your health, and allows you to keep your phone hidden away in your pocket. Chronos is invisible, nobody knows you’re even tracking your health or silencing a phone call. This is how wearables should be - personal. What are key features of the Chronos? We’ve spent the last year and half honing our feature set and have distilled it down to three things. 1/ Fitness tracking – counting steps and measuring general daily activity. 2/ Notification filter for your smart devices – users can set the device to only bother them for critical interruptions like Mom calling, an email from the boss, an upcoming appointment, etc. 3/ Chronos is ultimately an invisible device that enables control of your phone from any watch. Chronos has as much phone control as all the latest smart devices. You can tap your watch to silence a call, you can skip to the next song, snap a photo from a distance – all from the face of your favorite time piece. Are there any features you’ve consciously left out? The biggest thing we’ve left out is a heart rate monitor. Tracking heart rate takes a lot of processing and battery power – for little benefit. During our design process we surveyed 1,000 people about what they wanted from a smart wearable. None of them had a good answer for why they wanted a heart rate monitor. While most consumers will say they want a heart rate monitor, there is little you can do with the number. Granted it may be cool to watch your heart tick but we’re trying to keep Chronos as minimal as possible. HR is in our product roadmap but we’ve chosen to sacrifice HR for a slimmer, less intrusive v1 product with longer battery life. Why do you think wearables haven’t yet been widely adopted? What we wear is a reflection of who we are – personal style is important for everyone and the more unique the better. Wearables like the Apple Watch and Fitbit all look the same. There’s no expression of personal style, and they often come with negative stereotypes like ‘techie’. If all the benefits of the Apple Watch were baked into a single T-shirt design, nobody would wear it because they don’t want to look the same as everyone else. Wearable haven’t been widely adopted because we can’t wear them as a reflection of who we are. With watches there are thousands of choices from Rolex to Timex with every color and pattern imaginable - and Chronos works with almost all of them. Chronos is the first wearable that lets users express exactly who they are. Does Chronos easily fit on any style watch? We fit over 80% of watches sold today and every watch on the top 20 best seller list. How many different size variations is that? We have one size: 33 millimeters in diameter (just over 1 inch). Watches are trending bigger and bigger these days - 42 millimeters is the average for men while women’s watches average 38mm. Also, we’ve designed Chronos to make sure it fits on the best selling watch in the world, the women’s Michael Kors watch. The only watches we don’t yet fit are the ultra small timepieces, which we’ll adapt to with V2. How do you think about your market? And how does that map against the entire watch market? Our direct competition is the current smartwatch and wearables market: Apple, Fitbit, Pebble, etc. Yet our addressable market is actually much larger than theirs. 55% of Americans already wear a traditional watch every single day. To add a smart device, they can either swap out their highly personal timepiece for a commonplace Apple Watch or wear two devices on their wrist (personal watch + Fitbit). With Chronos consumers can wear one item – their favorite watch. They can also swap our tiny disc between watches if they have multiple timepieces. Established watch companies need a way to compete with Apple and Pebble. They love Chronos because we turn any of their products into smart devices. Their customers will become our customers and the watch market is huge. How many watches are sold each year? The watch industry is enormous. 2014 was record setting - 1.2 Billion watches were sold last year (that’s more than cell phones) and sales are up even more in 2015 despite the Apple Watch release. The watch industry is a lion, it’s a growing industry that’s got a lot of amazing metrics, internationally and domestically. 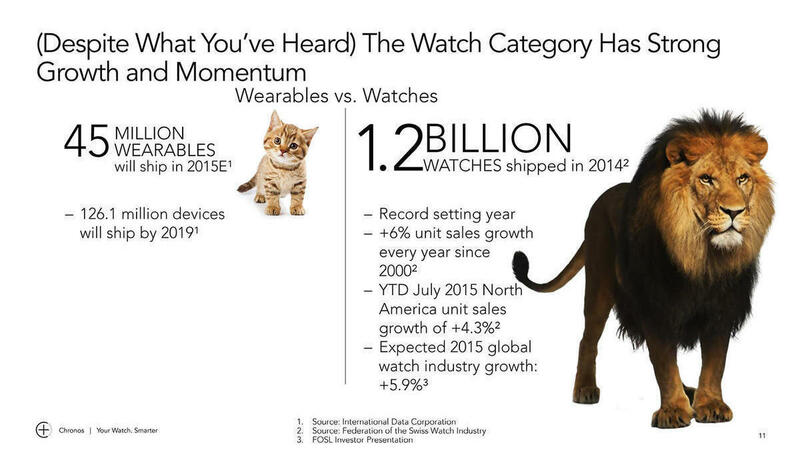 By comparison current wearables sales is like a fast growing kitten - expected to sell 45 million units this year. 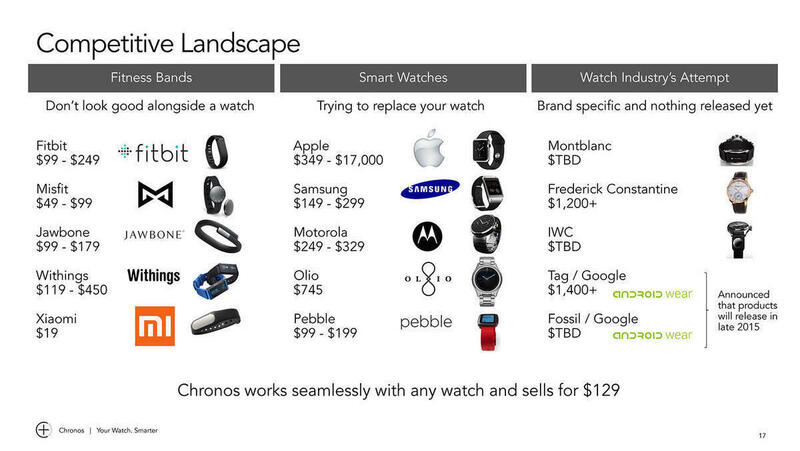 The vast majority of that is fitness trackers, while Apple has pushed less than 10 million watches. Who else is taking a similar approach? Who else is building smart devices for regular watches? A few companies have attempted to build an attachable smart device similar to Chronos. However, they all dramatically change the look and feel of your timepiece. Nobody has built an attachable device in as discreet a way as we can. There are a few established watch companies that have tried to integrate ‘smart’ tech into their own watches. Fossil - at the lower end of the market - just bought a fitness tracker company called Misfit and has plans to integrate the tech into a few new watches. High end players like Montblanc have also tried their hand at smartwatches. They built a small screen into their classic watch strap, but reviews suggest the Bluetooth connection is spotty and more often than not just doesn’t work. IWC built a connected strap with a fitness tracker built into the band of a $10,000 watch. Both these brands are at the very top of the watch market and still their technology just doesn’t work well. How do you think about Fossil as a potential threat? Fossil just bought the Misfit fitness tracking device and they also just launched their Q line of connected watches. It’s clear that connectivity is an important part of their future and the watch industry as a whole. Yet Fossil owns just a small slice of the affordable watch market – they’re huge in the U.S. but just a small player globally. Fossil’s recent jump into smartwatches is a great sign for the industry. Other watch companies are starting to realize that connected technology in their watches is inevitable. Many have already reached out to partner with us – Fossil has actually opened a lot of doors for our OEM strategy. Even if Fossil manages to perfect the technology – which is a long shot for a company with zero connected device experience – other watch brands won’t work with a competitor as their tech partner. Chronos doesn’t compete with anyone building watches, so every watch brand will prefer to partner with us rather than buoy Fossil. Why else do watch brands love the Chronos product? Chronos is the cheapest way for any watch company to offer connected devices. Before Chronos it was exorbitantly expensive for any company just to try this – tooling a prototype costs tens of thousands of dollars. Now they can play with smart tech for just $100. Chronos also fits well with the trending customization movement. Watch companies have started to offer a variety of customization packages like multiple straps, interchangeable faces, etc., all together with your watch. Chronos is the perfect addition to those customization packages. Now companies can sell one watch that includes a variety of colors, straps, faces, and a connected device. Finally we provide an amazing app which they can use to interact with their customers. This has never before been possible for watch companies – they had no way to engage their customers after a sale. At the simplest level, they didn’t know when and how often their customers wear their watches. Simply knowing this fact can open up a lot of doors to direct marketing to create a stronger relationship with their customers. Also, customers will be checking the application regularly to check on their activity and program their notifications. This regular engagement provides more opportunities to engage and market to their customers - something they’ve never been able to do before. Watch brands are very excited about this opportunity. You soft launched a month ago. Can you gauge initial reaction to the product? What’s next? We soft launched with some press articles in early November and pre-sold 250 units in 2.5 hours. We added 1,000 units and sold those out in a week. We’re expecting another wave of press in mid December. By all measures initial response is going very well. If all goes according to plan, we’ll deliver the first Chronos by early Spring. We’re also aggressively pursuing retailers to launch with prior to graduation season and Father’s Day (which is the second peak in watch sales after the holidays). Retailers like Best Buy, Neiman Marcus, Nordstroms, Bloomingdales, etc., are high on our priority list. What’s your pricing and cost model? Our current pre-sale MSRP is $129. While our cost of production for our initial 10,000 units, including shipping, hovers around $25. Direct sales margins are unbelievable and retail sales are still upwards of 65-70%. Are you already selling to watch companies as an OEM? And how is that sales process going? We’re negotiating with a number of watch manufacturers right now. They’re all testing the Chronos in house at the moment, giving us feedback, and a few have moved on to the LOI phase. All of them are super eager – but we really just released the Chronos so it’s still a bit early to tell how the OEM sales process will play out. There’s a couple ways we can structure these deals: we can license the hardware or we can be an end to end supplier for any of these watch companies. We’ll also license the software for an ongoing fee. Our customers will still own their customers, but every interaction will happen via the Chronos app and we’ll have access to all that customer data. Will customers have to use the Chronos fitness app? Or can they use their preferred fitness app? We hope to build a better app experience than any of our competitors but we also understand that some customers want to stick with what they know, so we’ll easily integrate with any fitness tracking apps out there. For instance, MyFitnessPal has a huge user base and we definitely don’t want to exclude them from being Chronos users. We’re ready to sync all Chronos data with their app. What’s the biggest challenge you’ve had to solve? What problems will you face in the immediate future? Our first major challenge was designing the Chronos to be so minimal – it’s now the thinnest wearable product in the world. This is huge because you can hardly notice the Chronos on your watch – it’s effectively invisible to both touch and sight. We also designed it to be all metal which brings an added level of quality to the Chronos. A Rolex owner would never attach a plastic product to their favorite timepiece. Next we have to partner with watch brands and establish ourselves as the defacto smart watch solution for any watch company. It’s still early but this has been surprisingly easy so far – everyone we speak to is receptive to Chronos as an OEM. They know we’re not competing with them but actually helping them compete with the Apples of the world. How is the battery life? How does charging work? The Chronos lasts 36 hours, and charging is as easy as dropping your watch on the charging cradle. 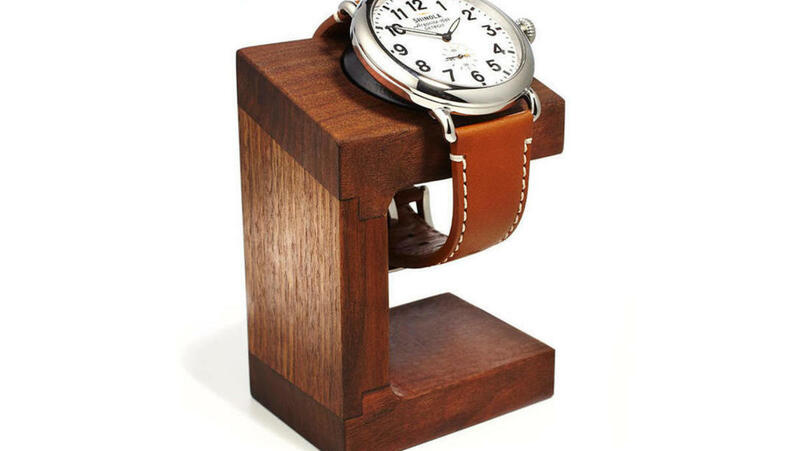 Nearly everyone takes their watch off at night, so we’ve designed Chronos to work with this routine by making charging simple, no need to take Chronos off your watch, and we sell beautiful watch stand accessories to make sure your watch continues to look great bedside. How defensible is your tech? How will you stay ahead of the competition in this regard? Chronos has taken ~25 people 18 months to develop. This is a sizable head start and we’ve also filed a variety of IP protections on the product. We’re the first to market on the back of an incredible press launch. To seal the lead, we have to execute on partnership deals and be the first in big box retailers. If all goes well we’ll soon be synonymous with transforming your existing watch into a smart watch. Tell us about the team and how the idea for Chronos came about? I (Mark) was an investment bank at Piper Jefferey before Chronos, handling transactions in the consumer and technology space. Over eight years as a banker I realized just how much I love how the consumer and technology can interact. All the while I wore my favorite watch (gifted by my wife on our wedding day) daily and never wanted to exchange it for a commonplace Apple Watch. The moment I had the idea for an attached device I immediately filed the IP and went out hunting for a Co-Founder. Luke has been incredible since we got together a year ago. Before Chronos he was on the Product Innovation Team at Samsung as the leader of prototyping before being promoted to Innovation Manager. Besides Luke and I, we have a few other people on staff but we largely work with a couple agencies to keep costs and hiring risk down. How will you use the money raised this round? 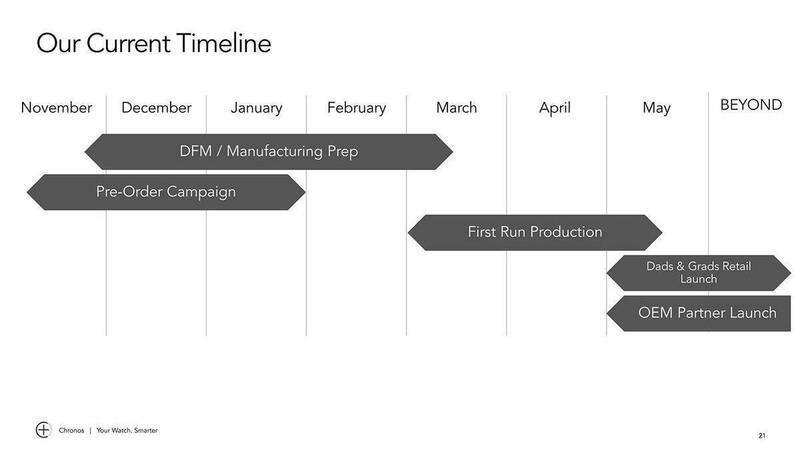 We’re 100% focused on product manufacturing and launch over the next few months. To do this we need to make several key hires: a firmware engineer, several more software developers, and an Android developer. This money will also get us through our first OEM deals. Once we sign a couple big partners we’ll be in a great position for our Series A – hopefully by early Summer. You did some early customer research. Did you find anything surprising? Yes. Initially we assumed our target customer would be largely wealthy males. We were totally wrong. The love for Chronos was split 50/50 male and female and evenly across a variety of age groups. Our early sales are nearly 40% overseas. We couldn’t be happier with this distribution. The best news though? 90% of those surveyed wanted to buy a new watch, even though Chronos converts the watch they already wear. Watch wearers want connectivity and are currently sitting on the sidelines when it comes to new watch purchases. This number is a huge selling point for us when negotiating with OEM brands – we can prove that customers want connectivity, and connectivity will drive sales for their brands. Chronos is conducting a Regulation D offering via Wefunder Advisors LLC. CRD Number: #167803. Here's a cartoon for your trouble. That’s why we're intrigued by Chronos, a barely 2-year-old San Francisco-based start-up that’s devised a way to add a handful of smartwatch functions like fitness tracking and message notification to almost any wristwatch via a wafer of stainless steel roughly the size and shape of a U.S. 50-cent piece. 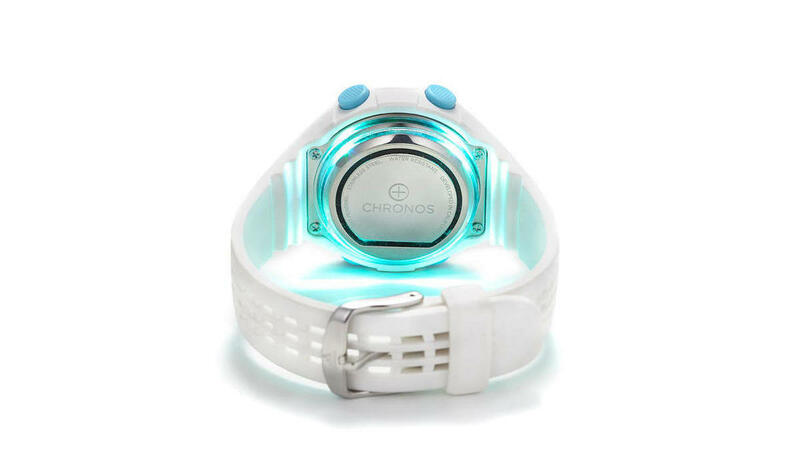 The Chronos pad can light up and vibrate when your smartphone receives new messages or calls. However the device does not have a screen or voice control as found on most fully-featured devices. The company's co-founder Mark Nichol told BBC technology reporter Chris Foxx he had focused on including the most 'critical' functionality. Mr. Casey is helping entrepreneurs, especially those in wearable devices, bridge the tech and fashion worlds. Such as the smart jewelry maker Ringly and Chronos, a device maker whose disc transforms a traditional timepiece into a wearable send staff members to San Francisco. The Chronos smart disc doesn’t look like much on its own – that’s okay. The Chronos smart disc doesn’t look like much on its own and the edge of the Chronos disc are mini-LEDs, that allow Chronos to display blue, yellow, red, green, or purple colors. The Chronos device is one of the best attempts with a small metal disc that turns any watch into a smartwatch. Inside the Chronos is an array of sensors, a few LEDs, a vibration engine, and a battery. Chronos is working on technology to make all watches smart. The new invention is a cheap, but not substandard alternative for the expensive smartwatches that we have already seen on the market. Chronos’ disc is barely noticeable, but it is highly efficient when it comes to displaying notifications. 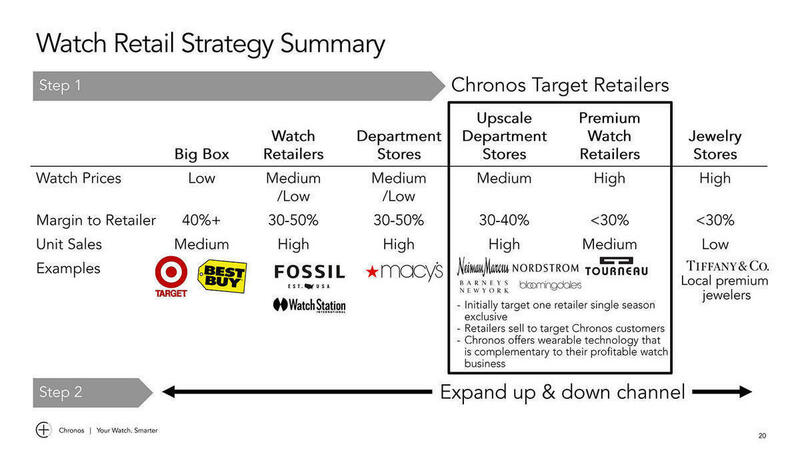 Chronos, however, is paying attention to the needs of customers. Chronos is made of a tiny rubber disk that you can safely attach to the back of your watch. approximately 3 millimeters thick, Chronos won’t turn your common watch into a Smartwatch overnight, it certainly can do almost all the things a Smartwatch does. Millennial entrepreneurs Mark Nichol and Luke Fromowitz launch Chronos to discreetly transform any watch into a fully connected time piece featuring touch patterns, health tracking and smart notifications. Chronos is not a smartwatch, but it’s a device that can turn an old Rolex watch into a semi-smartwatch that can sync with a smartphone, either an Android or an iPhone. Chronos is not a smartwatch, but it’s a device that can turn an old Rolex watch into a semi-smartwatch that can sync with a smartphone, either an Android or an iPhone. Chronos discreetly attaches to the back of your watch to bring fitness tracking, curated notifications and more to your favorite timepieces! From timeless heirlooms to the latest trends. Chronos in a small disc of 3 mm thick, is placed in the back of your conventional watch, to make it a SmartWatch and enjoy all the features it has a SmartWatch. The Chronos disk uses technology "micro-suction" to connect to an application that can be downloaded to your iOS or Android device and connects via Bluetooth. 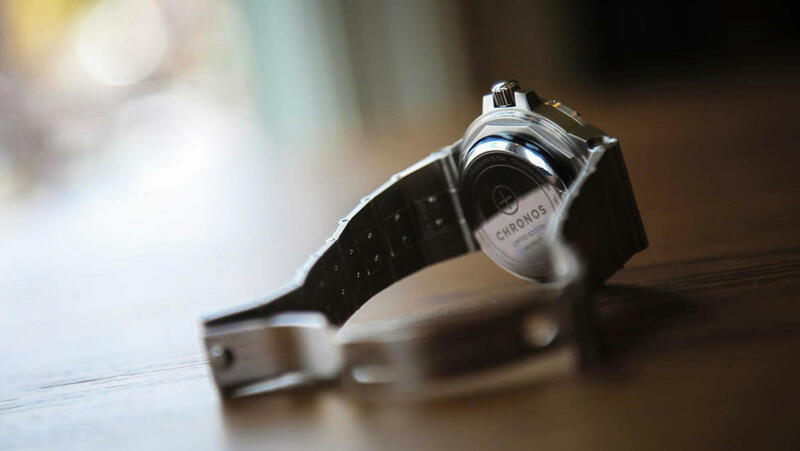 The Chronos disc fits onto the back of over 80 percent of watches, making any watch a smartwatch. The Chronos disc also boasts 36 hours of battery life, can be wirelessly charged and is Bluetooth-compatible. The Chronos is a small, 3mm thick disc that attaches to the underneath of your current regular watch. It clings on using a suction system that avoids any messy sticky pads, and makes it easy to swap between watches. With the Chronos Smart Watch Disc, you don't have to. It mounts to the back of nearly any timepiece, it's comfortable to wear. It gives you vibration and LED-based lighting alerts for incoming notifications, also uses its accelerometer to track your steps and movement. Now there’s a way to make any watch smart and still keep your notifications private with Chronos. The device has two main ways of getting your attention: vibrations and lights. Chronos uses wireless charging technology, eliminating the need for ports or replaceable batteries. Using Bluetooth LE, the battery life is good for around 36 hours. A smartwatch without buying a smartwatch. The smartwatch not meet the favor of all users, even when they are cared for and innovative. Many people are fond of the classic traditional wristwatch, because it has a high sentimental value or simply because they do not intend to spend inflated figures for devices that become obsolete in a few months. Chronos is a tiny disc that you can slap on the back of any watch to add smart features. It can track fitness stats and it can pair with a phone to alert you about incoming messages thanks to a vibration motor and an LED light. San Francisco startup Chronos is aiming its new device, which launches Thursday. The metal Chronos disc is designed to resemble watch casing, so that it largely disappears when one uses the micro-suction cups on one side to attach it to the back a regular old timepiece. Chronos will adapt to many watches case (80% of watches currently available, according to its creators). Connecting via Bluetooth to a smartphone Notifications and activity tracking skills are thus part of Chronos. If you are a person looking for that "smart" functionality but still does not want to let go of traditional clocks, Chronos can be a perfect option for you. As SmartWatch become ever more common, we started seeing more and more companies entering the market for wearables. 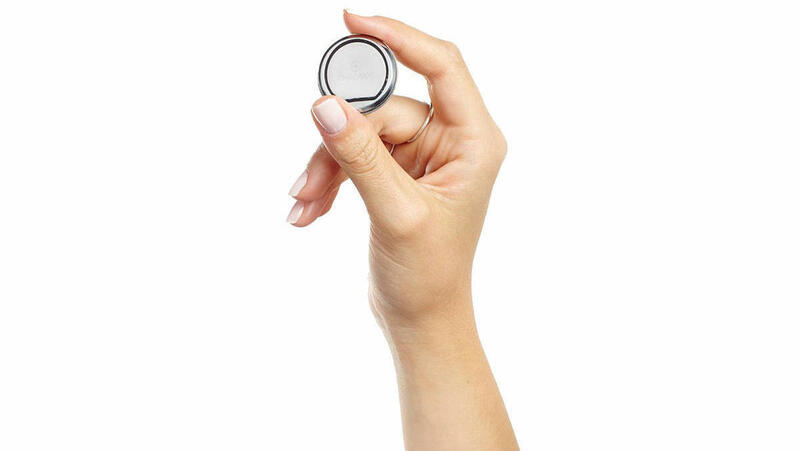 Chronos Wearables is a 3mm-thick stainless steel disc that can latch onto the backs of circular watch cases with a 31mm or larger diameter without glue or magnets. Inside, there’s Bluetooth 4.0 Low Energy, an accelerometer, a haptic motor and a nifty rim filled with notification LEDs. Chronos offers limited tap-based controls for smartphone interactions, such as declining an incoming call, or skipping to the next track when music is playing. Chronos is essentially a small circular disc that can be attached to the back of any conventional wristwatch. It has a vibration motor and LED light, it can be paired with a smartphone to alert the user about incoming messages. Chronos wants to bring a smartwatch to every watch wearer’s wrist—without you having to get rid of the watch you’ve already got. the company debuted its first product: a slim, stainless steel disk that sticks to the underside of any watch. 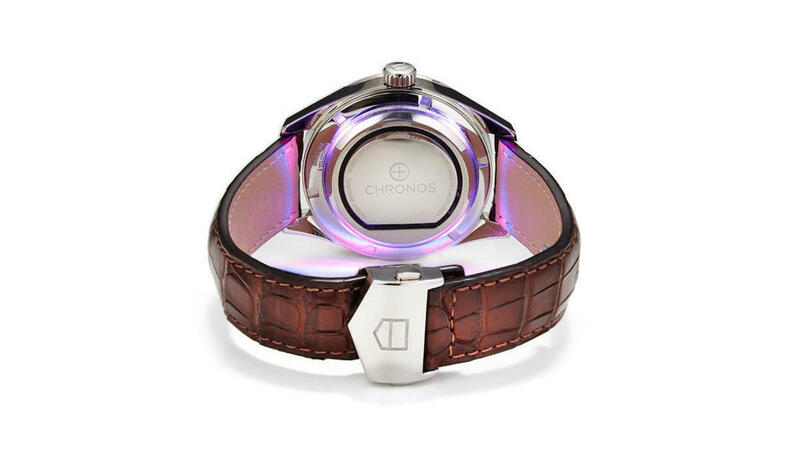 Chronos is like slapping a brain on the back of your favorite timepiece. It is an ulna-thin disc with 36 hours of battery life that brings curated notifications and health tracking to a watch of any age. Chronos is a discreet, coin-sized, device that sticks to the back of a regular watch – its makers claim it will fit 80% of all the watches currently on sale –that adds smart features. Those features include notifications and activity tracking. Enter the Chronos. It’s 100% “shut up and take my money”, no? The Chronos attaches to the back of your watch. And almost any watch. Well, truth be told, 80% of watches, at least according to Chronos. The Chronos' main job is to alert wearers to incoming notifications. Chronos' CTO, claims that this is actually something people are fond of, especially people with high-end watches. 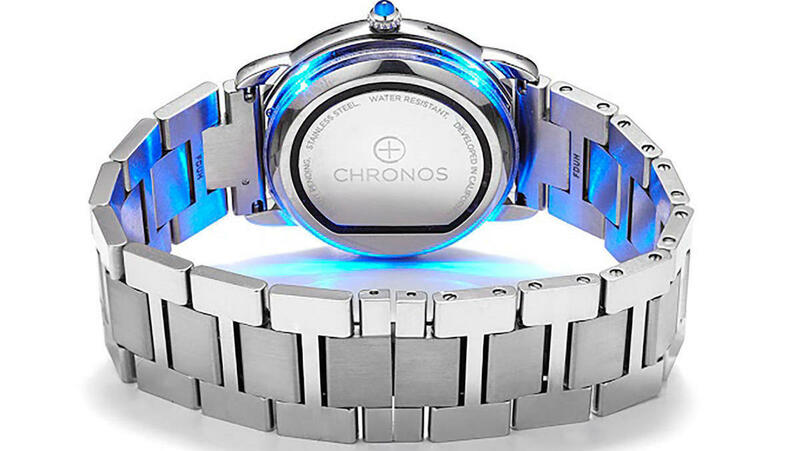 Chronos basically looks like a watch battery. Chronos does fitness tracking too. Chronos is a small metal disc that turns any watch into a smartwatch. It's waterproof, and a microsuction surface on the back lets it adhere to the back of a watch, situating it between the mechanism and your wrist. Thanks for vouching for Mark! If you'd like to invest in Mark, please open an account. We'll waive your fees if you do it now. We help promising founders get off the ground with $20,000 and world-class mentors. We asked Mark for 10 personal references. Can you vouch for Mark?